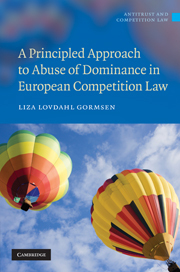 A principled approach to abuse of dominance in European competition law / Liza Lovdahl Gormsen. Machine generated contents note: 1. Introduction; 2. Consumer welfare theory, different schools of thought and efficiencies; 3. Objectives; 4. The legitimacy of the consumer welfare goal in Article 82; 5. The role of effects in Article 82; 6. Guidelines; 7. The way forward. Summary: "Three questions surround the interpretation and application of Article 82 of the EC Treaty. What is its underlying purpose? Is it necessary to demonstrate actual or likely anticompetitive effects on the market place when applying Article 82? And how can dominant undertakings defend themselves against a finding of abuse? Instead of the usual discussion of objectives, Liza Lovdahl Gormsen questions whether the Commission's chosen objective of consumer welfare is legitimate. While many Community lawyers would readily accept and indeed welcome the objective of consumer welfare, this is not supported by case law. The Community Courts do not always favour consumer welfare at the expense of economic freedom. This is important for dominant undertakings' ability to advance efficiencies and for understanding why the Chicago and post-Chicago School arguments cannot be injected into Article 82"--Provided by publisher. "Three questions surround the interpretation and application of Article 82 of the EC Treaty. What is its underlying purpose? Is it necessary to demonstrate actual or likely anticompetitive effects on the market place when applying Article 82? And how can dominant undertakings defend themselves against a finding of abuse? Instead of the usual discussion of objectives, Liza Lovdahl Gormsen questions whether the Commission's chosen objective of consumer welfare is legitimate. While many Community lawyers would readily accept and indeed welcome the objective of consumer welfare, this is not supported by case law. The Community Courts do not always favour consumer welfare at the expense of economic freedom. This is important for dominant undertakings' ability to advance efficiencies and for understanding why the Chicago and post-Chicago School arguments cannot be injected into Article 82"--Provided by publisher.